Once set in the tree the Friction-Saver provides consistent friction on your climbing line and minimizes damage to the living tree. 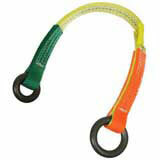 Available with aluminum or steel rings. Refer to the "Tree Climbers Companion" for installation instructions. Steel rings, 24" length, 5000 lbs.